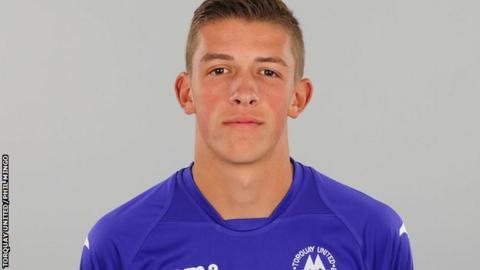 Torquay boss Chris Hargreaves says goalkeeper Dan Lavercombe has agreed a deal to sign professional terms. The 18-year-old is coming to the end of his youth contract and has kept two clean sheets in the last two games. "He wants to stay so we're happy to do that," Hargreaves said when asked if he would be offering Lavercombe a professional deal. "We've got a real prospect with Dan, I'm looking forward to working with him," he added to BBC Sport. Lavercombe made his debut in the 2-0 loss at Aldershot on Easter Monday but has not conceded a goal since, as the Gulls have gone on to register back-to-back wins for the first time since the middle of September. He had been understudy to Martin Rice since Jordan Seabright quit to become a car salesman in March. But the Torquay manager confirmed Lavercombe would make his fourth professional appearance when his side travel to Halifax on Saturday. "Dan will play, he's a real big talent," Hargreaves added. "I know people are looking at him already and I don't blame them for doing that because I've got no doubt that he's going to have a good long career. "He's very calm and very assured for someone of his age."